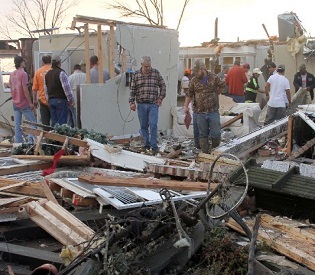 Dec 25, – Recovery crews and utility workers began cleaning up widespread damage on Thursday left by severe storms that spawned tornadoes across six states in the U.S. South and Midwest, killing at least 14 people and destroying scores of homes. Emergency declarations were issued in Mississippi and Tennessee, the two states hardest hit by severe weather on Wednesday that also complicated getaway plans for travelers looking to make the most of the long holiday weekend. With about 100 million Americans expected to travel over the Christmas holiday, most of them by car, the National Weather Service forecast isolated severe thunderstorms from the mid-Atlantic region to the Gulf Coast and record warmth in New York. Wednesday’s storm system triggered more than 20 tornadoes in Arkansas, Illinois, Indiana, Mississippi, Tennessee and Michigan, authorities said. One large tornado tore a 100-mile (160-km) path through northern Mississippi, demolishing or heavily damaging more than 100 homes and other buildings before plowing into western Tennessee, authorities said. Mississippi Governor Phil Bryant declared a state of emergency in areas affected by the storm, saying 14 tornadoes had touched down in his state. Bryant said seven people were killed and one person was missing. “Everybody is pulling together here in Mississippi today to help respond to this disaster,” Bryant said on CNN. He said shelters had been set up and the full extent of the damage would not be known for several days. Mississippi authorities said some 40 people were injured in the six counties that bore the brunt of the storms, and that a 7-year-old boy was among those killed. Six storm-related fatalities were reported by authorities in Tennessee, and an 18-year-old woman was killed in Arkansas when a tree crashed into her house, authorities said. Thirteen counties in Tennessee suffered severe damage, with a post office destroyed and a state highway washed out, officials said. Emergency crews in Mississippi, Alabama and Tennessee searched the ruins of splintered buildings for several people listed as unaccounted for, and scores were reported injured throughout the region. A rare tornado touched down in Canton, Michigan, and about 15,000 homes in the state and neighboring Wisconsin were without electricity. The National Weather Service posted a warning for gale-force winds on Lake Michigan, where waves were expected to crest at 15 feet (4.6 meters). About 500 flights were delayed or canceled at Atlanta’s Hartsfield-Jackson airport as Georgia’s capital was hit by a thunderstorm. Meanwhile, much of the Northeast enjoyed balmy weather on Thursday, including New York, which surpassed its record for the warmest Christmas Eve by reaching 71 degrees Fahrenheit (22 Celsius). Cold and snow were forecast on Christmas Day for much of the U.S. West, including temperatures in the teens in Montana and snow likely in Washington, Oregon, northern California and Nevada. Press journalist for HRO media – Debi Campillos reports.